This past fall, Ford School alumni elected six of their peers to serve on the Alumni Board. Those elected to serve from January 1, 2014 through December 31, 2016 are Peter Fritz (MPP/MBA '10), Keith Fudge (MPP '09), Tres Fuller (BA '10), Catherine Lomax (MPP '01), Jomo Thorne (MPP/MBA '08), and Paul Weech (MPP '81). 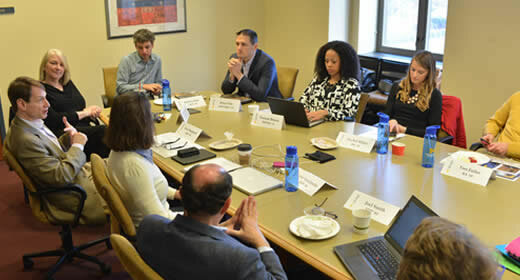 The Alumni Board strives to help increase the visibility of the Ford School; strengthen the alumni network; and assist the school with student recruitment, career services, and alumni relations activities. Some of its most recent initiatives include the annual Worldwide Ford School Spirit Day events, fundraising efforts for student support, and the alumni talent coach program. Alumni Board members serve three-year terms and each year, six seats become open for election to encourage broad alumni involvement and representation on the Board.